(Bloomberg) -- The U.S. will remain the Philippines’ only military ally, Foreign Affairs Secretary Teodoro Locsin said, amid an increased Chinese presence near a disputed island in the South China Sea. The U.S. is “the only world power that is a bastion of democracy and human rights, is and will remain our only military ally. We don’t need any other,” he tweeted on Sunday. Relations are improving between the U.S. and the Philippines, which shifted toward China after Duterte took power. More than 7,000 soldiers from the Philippines and the U.S. are participating in this year’s annual joint military drills, which are taking place despite President Rodrigo Duterte’s 2016 call for a split with Washington. The Philippine leader has questioned whether the U.S. would defend his country if China seized disputed reefs and shoals in the sea. 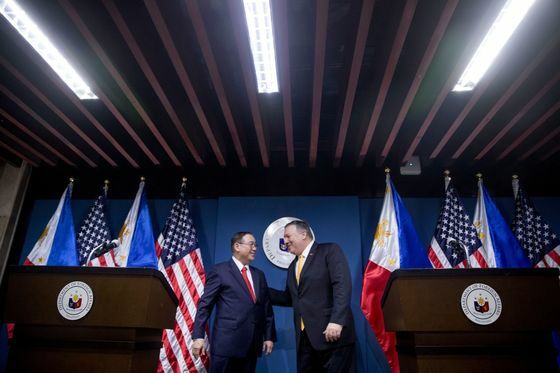 U.S. Secretary of State Michael Pompeo assured in March that a defense treaty would apply if Philippine vessels or planes are attacked in the waters.